What, All Flights To Utah Were Booked? Whenever we blow $600,000 on blackjack and loose women, we know that it's time for another trip to Cuba. 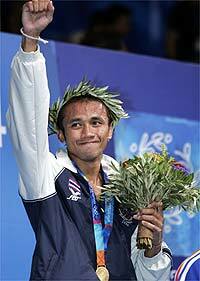 Olympic officials in Thailand recently had that same thought, as they packed off Olympic boxing champion Manus Boonjumnong to the balmy shores of North America's favorite island, with the notion of curing him of his wild, late-night Bangkok lifestyle before it's time to start training for the 2008 Beijing Olympics. The light-welterweight, one of Thailand's biggest celebrities, has been ordered to "steer clear of bars, gambling and women and focus on getting in shape." We don't know what one has to do to earn the reputation as the biggest reveler in Bangkok, but we'll bet it involves live chickens. And fortunately, it's entirely impossible to get in trouble in Cuba.